Get arms that have size, shape, and definition without having to spend more time in the gym than you need. Sow 30 minutes of work, and reap the reward of bigger, better arms! I have a fascination with practical strength. Many have called me a purist, which is probably due to the loving relationship I have with my power rack and how I snuggle my Atlas stones at night. I also enjoy working with people and teaching them that there's more to muscle than aesthetics. However, I tend to run into the same problem that Bob Hoffman did: Even though bodybuilding as a sport had yet to emerge, his Olympic weightlifters were obsessed with the size and shape of their arms. Instead of fighting the biceps and triceps mania, I've decided to embrace it. 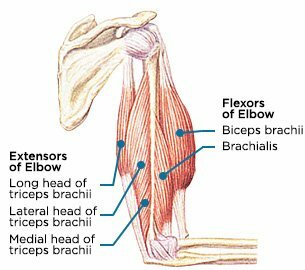 Because of the different origins, attachment points, and lengths of the biceps and triceps, you can separately emphasize each head by changing the position of your arms or the rotation of your wrists. And because your arms are heavily recruited during other upper-body work, you only need a small amount of specialization to turn those shapeless lumps into chiseled man-hammers. During this program, you'll learn how to utilize a variety of techniques to develop full and balanced arms. You'll do three pairs of exercises, supersetting a triceps movement with a biceps movement. You'll start with some heavy strength work and transition into a higher rep range for hypertrophy. This workout may not take long, but you'll get all the emphasis you need to add size and shape to your biceps and triceps. In my opinion, there isn't a better movement for building thick, strong triceps than the JM Press. This movement is frequently used by powerlifters to turn saddlebags into extensors that would make Optimus Prime jelly. Knock out five reps and immediately go to the chin-ups. After adequate rest, bump the weight up and do it again. Continue increasing the weight each consecutive set so that your final set is an absolute battle with the devil. While primarily a back exercise, EMG studies have demonstrated that the supinated grip results in heavy biceps recruitment, particularly of the short head. You may either use a band for assistance, or add a chinning belt to make the chin-ups more difficult. If you do them properly, dips are a great way to build your triceps. Ideally, you would use a "V-bar," which allows you to adjust your grip width, but work with whatever you have. In order to make dips effective, you need use a heavy load. For extra resistance, hold a dumbbell between your feet, use chains, or pick up a dip belt. Protect your shoulders—don't let them go below your elbows. By using a reverse grip, you take a little "umph" out of the long head of your biceps. (You can test this by bending your right arm to 90 degrees and placing your left hand on your right biceps. Rotate your wrist to feel tension change in your arm.) In the reverse curl, your brachialis and brachioradialis are going to get waxed. Few things are more impressive in a bodybuilder than a thick brachialis jutting out from under a nice peak. This overhead triceps movement emphasizes the long head. You will get better range of motion by doing this movement unilaterally (with one arm). Doing so will also reduce your chances for elbow pain. This movement places the arms behind the body, thereby lengthening the long head and engaging it further. Because parts of the biceps also help supinate the wrist, I like to start with a hammer grip at the bottom and rotate as I come up.